President Obama has decided to send an ambassador to Syria. He is doing the right thing. Indeed, relations with Syria should have been normalized long ago as Baker and Hamilton advised. The Bush administration’s policy of conquering Iraq while insisting that it’s neighbors would be next in line for regime-change was unsound and born of arrogance. Washington gave Syria and Iran little choice but to fan the flames of the Iraq insurgency. It didn’t have to be. Both countries could have been reassured about US plans in Iraq had Washington limited its objectives. There was no reason for either country not to want the end of Saddam’s rule. After all, Saddam had done so much to make the lives of Syrians and Iranians miserable over the years. On an immediate level, the announcement to return an ambassador is tied to Syria’s agreement on Iraq security and intelligence sharing. Twice Secretary of State Rice met with her Syrian counterparts and tried to jumpstart an agreement on Iraq. At Sharm al-Shaykh in May 2007, she had proposed sending two generals to Damascus, but refused to normalize relations with Syria or send an ambassador, which ultimately scotched attempts to improve US-Syrian cooperation under the last administration. The end result of Bush’s refusal to compromise with Syria was the cross-border raid to kill Iraqi resistance facilitators. Eight Syrians were murdered, Syria claims, as collateral damage during the Abu Kamal raid that took place only weeks before the presidential elections. General Petraeus had sought to avoid such bloodshed by going to Damascus himself in order to broker a political deal that might have induced the Syrians arrest the facilitators when Americans asked them to. V.P. Cheney forbade any attempt to broker such a deal, I was told by good sources in the anti-terrorism community. Syria has worked hard to improve relations with Washington. It scrupulously kept out of the Lebanon election process, even as the US sent one senior statesman after another to warn Lebanese not to vote for enemies of the US and as Saudi money was lavishly spent on getting pro-March 14 Lebanese to fly home to vote. Syrian authorities have entertained a series of military envoys to work out guidelines on Iraq border issues; and they have pushed the Palestinians to form a government of national union in order to pave the way for US engagement with Gazans. WASHINGTON — President Obama has decided to send an ambassador to Syria after a four-year hiatus, two senior administration officials said on Tuesday evening, in a sign of the deepening engagement between the Obama administration and the Syrian government. The State Department informed Syria’s ambassador to the United States, Imad Moustapha, of the decision on Tuesday, said one official, who spoke on condition of anonymity because it had not yet been announced. Mr. Obama has not yet chosen a person for the post, he said. The administration’s decision was first reported on CNN’s Web site. The State Department’s spokesman, Ian C. Kelly, declined to comment on the report, but other officials said it was a logical step in Mr. Obama’s pursuit of normal relations with Syria. The State Department has twice dispatched Jeffrey D. Feltman, the assistant secretary for the Near East, and Daniel Shapiro, a National Security Council official, to Damascus for exploratory meetings. Just before Mr. Mitchell’s visit, an American military delegation visited Damascus for talks about how Syria could contribute to the stabilization of its neighbor Iraq. American officials are worried about foreign insurgents flowing into Iraq from Syria. The Bush administration withdrew the ambassador to Syria in 2005 to protest the assassination of former Prime Minister Rafik Hariri of Lebanon. Washington suspects Syria of being involved in the attack, which it denies. Since then, a chargé d’affaires has been the highest-ranking American diplomat in Damascus. The new ambassador would have to be confirmed by the Senate. And as is customary, the Syrians could register objections to a candidate. “The Lebanese daily Al-Diyar has reports that Prince ‘Abd Al-‘Aziz, the son of the Saudi king, met with Syrian President Bashar Al-Assad in Damascus on June 20, 2009, in preparation for a meeting between Assad and the king. The daily also reports that Saudi Information Minister ‘Abd Al-Aziz Al-Khoja has likewise visited Syria for a meeting with his Syrian counterpart, Mushen Bilal. According to the daily, the ongoing rapprochement between Syria and Saudi Arabia may affect the political atmosphere in Lebanon and the establishment of its new government. “…Shimon Shiffer reports in Yediot Acharonoth: In messages relayed in the last few days to Ankara by figures close to Netanyahu it was said: “Israel is willing to renew the talks with the Syrians.” However, it was made clear that the Netanyahu government would not withdraw from the Golan Heights and would not reply in the affirmative to the Syrian demand to begin the talks from the point they were left off by the Olmert government. DAMASCUS (Reuters) – Palestinian President Mahmoud Abbas discussed on Saturday efforts to achieve Palestinian reconciliation with Syrian President Bashar al-Assad. “We agree with Syria that the dialogue should succeed,” Abbas’s aide Nabil Abu Rdainah told reporters. He was referring to Egyptian mediation between Abbas’s Fatah faction and Hamas, which is supported by Syria and Iran. Egypt has set July 7 as a deadline to find a solution for divisions between the two groups. Hamas leader Khaled Meshaal, who lives in exile in Syria, cancelled a speech he was due to make later on Saturday shortly after Abbas met Assad. No explanation was given. Abbas’s visit to Syria is the second since May. His aides said Abbas would not be meeting any Palestinian factions in Syria before leaving for Saudi Arabia for talks with King Abdullah on Sunday. June 19 (Bloomberg) — Billionaire investor Simon Halabi’s real estate companies defaulted on 1.15 billion pounds ($1.9 billion) of bonds backed by nine London office buildings as the recession cut the value of the properties by about 50 percent. Halabi started as a director of real estate investment company Property Trust in the 1980s. The Syrian-born investor is worth about $4 billion, according to Forbes magazine. He bought health chain Esporta for around 460 million pounds in 2006, using 330 million pounds of debt from Societe Generale, according to Eurohypo AG research. The doors have been opened to the Afamia Rotana Resort, Latakia. Located on a sandy peninsula, two kilometres from Latakia city centre, the new five-star resort brings a new level of comfort and a host of leisure activities to the city. Freih al Rawi, originally from Syria, is one of the thousands recruited to Bahrain to serve in its security forces in exchange for citizenship there. MADINAT HAMAD, Bahrain — On a recent evening, Issa al Jibb climbed the roof of his home and started hurling Molotov cocktails into the adjoining property of the Rawi clan. 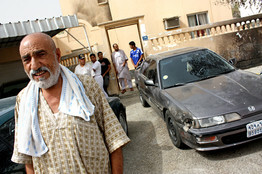 By the time Bahraini police shot him down with a rubber bullet, Mr. Jibb had managed to burn three cars and part of the building, and inflicted serious burns on two Rawi teenagers. This was no ordinary feud among neighbors. Mr. Jibb, 46 years old, is a native of this small Persian Gulf kingdom. The Rawis are originally from Syria, were recruited along with thousands of other Arabs and Pakistanis to serve in Bahrain’s security forces and eventually rewarded with Bahraini citizenship for their loyalty to the crown. Hostility between these two communities is on the rise, with several other clashes, car torchings and beatings reported in recent months. “Bahrainis think that we just don’t belong, that we’re aliens to this area and to this state,” says a Syrian-born army officer who lives nearby. Once hailed for its democratic reforms, Bahrain — a strategic island-state that serves as headquarters of the U.S. Navy Fifth Fleet — is increasingly rocked by sectarian and ethnic strife. Though the majority of Bahrain’s 530,000 citizens are Shiites, power remains in the hands of a Sunni royal family, the only such minority regime in the Arab world since the downfall of Saddam Hussein in Iraq. Suspecting its Shiite citizens of loyalty to nearby Iran, the island’s former master, Bahrain’s royal family has long relied on Sunni mercenaries from countries such as Syria, Jordan, Yemen and Pakistan to staff Bahrain’s army, police and security service. Earlier this decade, as Washington pushed for democratization in the region, Bahrain’s King Hamad freed political prisoners and established an elected parliament with limited powers. However, opposition leaders and some independent analysts charge, a parallel program began at the same time, largely ignored by Western nations that depend on Bahrain’s valuable naval facilities. The regime, they say, has sharply accelerated its policy of naturalizing Sunni mercenaries, aiming to inflate the size of the Sunni electorate — and to defuse Iran’s growing influence. Bahraini officials deny any such policy exists, and insist there is no discrimination against the country’s Shiites. According to Bahrain’s interior minister, Sheik Rashid bin Abdullah al Khalifa, only about 7,000 people were naturalized in the past five years. Opposition politicians, however, calculate the naturalization’s true pace at some 10,000 people a year, based on voter registration statistics — a big number in such a small country. People picked for this naturalization “aren’t just Sunnis,” but religious fundamentalists “who share the hatred of the Shiites,” asserts Hassan Mushaima, leader of Bahrain’s Haq Shiite movement who was imprisoned for three months this year for his role in violent street protests. Mr. Jibb, the Bahraini who threw Molotov cocktails into his neighbors’ home in Madinat Hamad last month, is a Sunni, too. The conflict began in December, when Mr. Jibb witnessed the beating of a Bahraini neighbor by the Rawis and other naturalized Syrians, according to his sister Leila. “The Syrians, they’re like a gang trying to control the whole area, bullying the whole street just to show who’s the boss,” she says. A few days later, the Rawis attacked Mr. Jibb with a hammer blow on the head, prompting a hospitalization, she says. Members of the Rawi household, headed by retired Bahraini army sergeant Freih al Rawi, and comprising some 40 people, deny they instigated the clash. “We know; there’s bad feeling for foreign people here,” says one of Mr. Rawi’s sons, an army officer. The night of May 29, Ms. Jibb says, her brother — who suffered psychiatric problems after the December hammer blow to the head — found himself the target of taunts by the Rawis again, and simply “lost his mind,” unleashing the volley of Molotov cocktails. Ms. Jibb has since fled her house, fearing revenge from the Syrian-born neighbors. Which Iran would Israel bomb? “… Israel is now gaining a more intimate, accurate familiarity with the Iranian public. The demonstrations have made quite clear that there is not one Iran or even two, but rather a number of Irans. There is the Iran that belongs to those who screamed, “Death to America and to Israel,” and there is the Iran that screams, “Down with the dictator.”…. It is still too early to predict how the demonstrators will act and in what fashion the Revolutionary Guards will respond, but this past week’s events will leave a historic mark in post-revolutionary Iran. It is a mark that should also be seared into the minds of the West in general, and the United States and Israel in particular. All in all, 30 years have passed since the Khomeini revolution, and the Iranian public is now rebelling against the system. True, this constituency has twice elected a reformist president who disappointed, and this time it does not appear that it is ready to give up, at least not easily. But hundreds of thousands of demonstrators did not pour into the streets due to American intervention or threats from Israel. They want a better Iran for themselves, not for Obama or Benjamin Netanyahu. They will be the ones to determine what qualifies as a better Iran. This is the crux of the confusion that we have stumbled upon. The grand enemy that was neatly packaged into a nuclear, Shi’ite-religious container has come apart at the seams. On the one hand, it threatens, while on the other hand it demonstrates for democracy. On one street, it raises a fist against America, and in another alley, streams of protesters march for human rights. For goodness’ sake, who is left to bomb? Until one week ago, the path was well-lit. An Israeli decision to strike depends on American policy, which depends on the outcome of the dialogue that President Obama seeks to begin with Iran. And, as military jargon so succinctly teaches us, the prescribed plan of action can be interrupted by unforeseen events. This is a segment of the Iranian population that is beginning to give rise to new questions. If there is a chance to change the system of rule – perhaps not now, but in the next Iranian election in four years – if there is a chance that Obama will gain greater leverage because the Iranian leader understands that he must compromise with his people, this will be a route that must be tried anew. The drumbeats of war were growing louder, and opposition to them louder still. But on that Monday afternoon six years ago, just off a plane from a critical Washington summit, Tony Blair insisted an invasion of Iraq was still not inevitable. “No one wants conflict… Even now, I hope that conflict with Iraq can be avoided,” he told the House of Commons on 3 February 2003. “Even now, I hope that Saddam can come to his senses, co-operate fully and disarm peacefully, as the UN has demanded.” Nonetheless, he admitted, if Saddam rejected that route, “he must be disarmed by force”. What the MPs listening intently to him did not know, however, was that the decision had already been made…. Further undermining the Shi’a explosives smuggling and bomb plot story is the fact that the Saudis had secretly detained and tortured a number of veteran Sunni jihadists with ties to Osama bin Laden after the bombing. According to a Norwegian specialist on the Saudi jihadi movement, Thomas Hegghammer, in 2003 – shortly before al-Uyayri was killed in a shoot-out in Riyadh in late May 2003 – an article by the al Qaeda leader in the al Qaeda periodical blamed Shi’a for the Khobar bombing. In a paper for the Combating Terrorism Center at West Point, Hegghammer cites that statement as evidence that al Qaeda wasn’t involved in Khobar. But one of al-Uyayri’s main objectives at that point would have been to stay out of prison, so his endorsement of the Saudi regime’s position is hardly surprising. Both Yusef al-Ayer and his successor, Abdel Aziz al-Muqrin, would fall into the category of “martyrs who were killed by security forces of the Saudi regime in the land of the two holy mosques” (Nicholas Blanford, Killing Mr Lebanon, London, Tauris 2006, p. 141). Once again, a transcript of the statement read (?) by Ahmed Abu Adas would be most useful. 9/11 Commission investigators later learned that, after bin Laden’s move from Sudan to Afghanistan in May 1996, a delegation of Saudi officials had asked top Taliban leaders to tell bin Laden that if he didn’t attack the regime, “recognition will follow”. In early 1997, the CIA’s bin Laden station even issued a memorandum for CIA Director George Tenet, who was about to travel to Saudi Arabia, identifying Saudi intelligence as a “hostile service”. Rumors are swirling on the streets of Iran that some of the thugs beating up young protesters speak no Farsi but only Arabic – in a Lebanese or Palestinian accent. They are assumed to be Hizballah or Hamas members. Has anyone heard this or does anyone have further information? Even if these rumors are totally baseless, they reveal the resentment of anti-regime Iranians towards their government’s imperialistic policies in the Middle East and its subsidization of foreign militant groups. The other point that a woman can marry two men, this is not Islamic nor accepted by christianity, who writes such law? they must be Idiots. As someone who had been living in the Gulf for a while, I could say that general sentiments of xenophobia and jingoism usually trump sectarian rifts. So your fellow indigenous Khalijee from the other sect is closer to you than a naturalized Syrian or Palestinian. I haven’t been to Bahrain so I don’t know what’s it like there exactly. But as it could be concluded from the WSJ article and many others, most of the current serious national security issues for the Gulf States stem from demographic imbalances. These are ‘brittle regimes’ as Hassanein Haykal put it in his book “The Second Gulf War”. 19 years on, the situation hadn’t changed much. And I’m not sure if open debate or dialogue is the best idea. I don’t really know what’s going to happen when America’s power recedes and its inevtiable policy of isolationism come into place. Hopefully by then they’d have stronger armies and more solid internal fronts. Oh yeah, forgot to bid hearty welcomes to the new ambassador. Whoever the hell he is going to be. Will Iran be President Obama’s Iraq? While the protests are subsiding, days of round-the-clock, ill-informed commentary in the United States have helped to “sell” several dangerously misleading myths about Iranian politics. Left unchallenged, these myths will inexorably drive America’s Iran policy toward “regime change” — just as unchallenged myths about Saddam Hussein’s pursuit of nuclear weapons and ties to Al Qaeda paved the way for America’s invasion of Iraq in 2003. In response to fraud allegations, the Ministry of the Interior has, for the first time ever, published the results of each of the 45,713 ballot boxes. With the personal information for all the nearly 40 million voters in the election registered on a computer database and each voter’s fingerprints on his or her ballot stub, it is clear where people voted, and each vote can be accounted for. The Guardian Council — tasked by Supreme Leader Ayatollah Ali Khamenei to review alleged electoral irregularities — has acknowledged that the number of votes cast in 50 towns exceeded the number of eligible voters residing in those communities; roughly 3 million votes fall into that category. But this is not unusual: Iranian citizens may vote in presidential elections anywhere in the country. Since the election took place on the Iranian weekend, many people had left their homes for their hometowns and villages and cast their votes there. Thus, in some places, the number of votes exceeded the number of resident, eligible voters. Kamal, thanks for keeping us well informed. I noticed that the Jerusalem Post was also very concerned about these rumors. Thanks for not addressing the substance of my point. 1- I clearly labeled the allegation as a rumor. My sources are Iranian friends on the ground in Iran, not the Jerusalem Post. 2- I said that the rumors are significant, even if untrue, because they reveal the psyche of anti-regime Iranians: they resent their government’s subsidization of foreign militias. Or do you disagree with this? 3- If you don’t like the Jerusalem Post, try the Guardian – or is Robert Tait also a Zionist propagandist? So I would be careful about them and consider them as attempts of dividing the Muslims and the Arabs. I tend to agree with Norman’s last observation. The only figure who seems to continue to hold his guns is Mahdi Karroubi. He does not have as many followers as the other players who seem to have chosen silence. Karroubi also postponed his call for holding a 3-day vigilance event to honor those who were killed from this week till next week. The couple hundred demonstrators, who show up here and there according to some reports, could belong to any fringe groups trying to capitalize on chaos. They have not much to lose. These are the ones that could possibly be the so-called ‘collaborators’ with the West (U.S. and Britain) that the supreme leader and government have hinted about. The bottom line is the so-called opposition (Rafsanjani, Moussawi, Khatemi, etc…) are sons of the 1979 Revolution. They are not the Thomas Jeffersons or the Wilsons of Iran. Norman ,thanks to this regime ,millions in Iran not only hate the Arabs ,but Islam too. Kamal ,may be for hizbollah because it is part of the iranian regime ,but Hamas is not so close to the iranian regime as many wrongly believe and for sure not a wilayat faqih puppet as hizbollah is. I agree that it is highly unlikely for Hamas members to be running around in Iran. It extremely difficult, if not impossible, for militants to travel in and out of Gaza. The Hamas allegation probably comes from Iranians unable to distinguish between Lebanese and Palestinian accents. On the other hand, Hizballah militants regularly go to Iran for military and spiritual training. If there really are Arabs doing the regime’s dirty work in Iran, they are definitely from Hizballah. That rumor is to silliness as glue is to paper. Today I reread the plot of Albert Camus’, “The Stranger”, which caused me to pause. The protagonist, Meursault, shoots dead an Arab in cold blood for no particular reason at all. Furthermore, he plugs the corpse with another 4 bullets, for the hell of it. The story takes place in proto-fascist, Vichy-controlled, colonialist, racist, European-governed Algeria and yet the French authorities are going to give Meursault the guillotine for murder. One wonders if, in today’s Israel, Meursault, would even get more than a slap on the wrist. The timing of the announcement of a new ambassador to Syria amidst the upheaval in Iran and so close to the pull-out date in Iraq for many US troops is curious. But I imagine it has more to do with the elections in Lebanon and the desire to see this government succeed than anything else. As far as the role of Palestinians in the Iranian post-election crackdown, this has a familiar ring to it. Certainly the relationship to Hizballah is well established. It is not hard to see why a regime would want assign its foreign legions the task of thug-based crowd control versus domestic forces. The chances for rebellion on the part of Iranian armed forces put on a front line against their own friends and family members would make employing foreign goons logical. However, some in the Iranian military must be questioning the moral case for bringing in foreigners to attack non-violent Iranian citizens. And members of Iran’s parliament must wonder what they must say and do to be re-elected in the future after such a vicious assault was unleashed in their own front yard. The Hamas ‘scoop’ by the Jerusalem Post was too much even for somebody as twitter-credulous as Nico Pitney (“9:45 AM ET — Where are the standards?”). He had, however, no problem at all with the earlier tweets about the presence of 5000 Hizbullah fighters. As you know, there are millions and millions of Hizbullah fighters and, in fact, some of them are probably hiding under your bed right now. It has also come to my attention that Lives of the Great Saints, the favorite book of a Llareggub family man and devoted husband (who, I may add, never went hiking on the trails and foothills of Bariloche), was not written by Nicholas Blanford. That’s a wonderful book, especially in the original French. Enjoy! Please everyone on SC remember and pray for the pinup laday of all times, Farrah Fawcet, Thank you. Hama mayor ‘personally’ (since Hama is already a utopia and everything in the city is perfect so the mayor doesn’t actually have anything to do) went with 30 policemen and some local hunters with their ‘illegal’ guns to execute 90 live stock of healthy pigs that belongs to a local farmer..WOW, what a mayor!! أشرف محافظ مدينة حماة وسط سورية على تنفذ حكم إعدام رميا بالرصاص على 90 رأس من الخنازير العائدة لأحد المربين المعروفين في مدينة السقلبية التابعة لحماة. وقال المربي كريم الصايغ في اتصال هاتفي إن محافظ مدينة حماة الذي كان يرافقه حوالي 30 عنصر أمن أمر بتنفيذ حكم الإعدام على يد صيادين يملكون سلاحا غير مرخص على حد تعبيره. وجمع مرافقي المحافظ الخنازير في مكان واحد قبل أن يأمر بفتح النار عليهم، وبعد انتهاء”المجزرة”، كما يصفها صاحب المزرعة تم دفن الخنازير بعد أن تم حفر قبور لها بواسطة الآليات الثقيلة. وأكد الصايغ أن وزارة الصحة تجري منذ بداية انتشار المرض في العالم فحوصات وتحليلات دورية على الخنازير في مزرعته وأن آخرها كان قبل أيام وأكد على عدم وجود إصابة. وكشف الصايغ الذي يملك مزرعة لتربية الخنازير منذ 30 عام أنه سيرفع دعوى على المحافظ لأن قرار الإعدام جاء مخالفا للقوانين التي أقرتها وزارة الصحة وتم بسلاح غير مرخص. ولفت الصايغ إلى أن عناصر الأمن أمروا المواطنين الذين صوروا عملية الإعدام بحذفها وأشرفوا على ذلك بأنفسهم كما أن أحد العناصر اعتدى بالضرب على أحد العاملين بالمزرعة ولا تزال أثار الكدمات ظاهرة عليه إضافة إلى اعتقال ابنه وإطلاق سراحه لاحقا. Jad you seem to really hate me and i am so proud to be born,make me as stupid or filthy as you wish do petitions against me but i have learned one thing,that your hate is really really pitiful! but we will be patient in israel cause we do not learn in schools when we are young your stupid hate education!